College students are bound to have bad days. It's tough living away from home for the first time with so much responsibility. 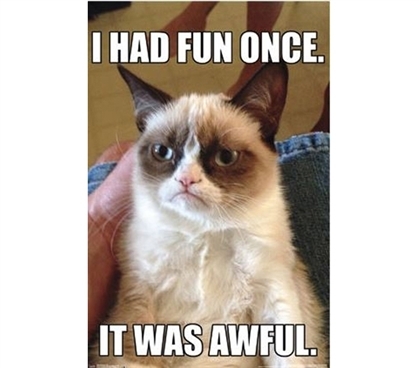 If it's one of those days where you are not amused by anything, Grumpy Cat shares knows how you feel. This Grumpy Cat - Fun Poster perfectly displays Grumpy Cat's outlook on life. If you're feeling down just look at this dorm accessory and know you're having a better day than Grumpy Cat! Fun and humorous dorm decor make the stress of college easier to bear. Having dorm supplies that can cheer you up is essential for living away from home! While he sure is grumpy looking, college posters like this dorm item will actually help to lighten the mood in college. It's a bonus feature when your dorm decorations can have a second feature like that. So when you're shopping for college, be on the lookout for such dorm supplies that will have that effect. As funny dorm stuff always becomes some of your most popular college items with friends!